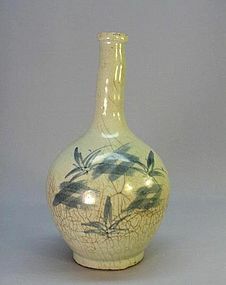 This interesting early 19th century Korean hand thrown blue and white vase is 9” high and 5” wide from the widest part. It depicts several plants and has texture style patterns in blue over the pale gray background. It is in excellent condition. This very nicely potted Korean Silla Dynasty (668~935 A.D.) buried black stoneware jar is 6” high and 7” wide. It has very nice inscribed decoration and ash fall glaze from the wood firing. It is in excellent condition.